GHCN (Global Historical Climatology Network)-Daily is an integrated database of daily climate summaries from land surface stations across the globe. Like its monthly counterpart (GHCN-Monthly) , GHCN-Daily is comprised of daily climate records from numerous sources that have been integrated and subjected to a common suite of quality assurance reviews. GHCN-Daily contains records from over 100,000 stations in 180 countries and territories. NCEI provides numerous daily variables, including maximum and minimum temperature, total daily precipitation, snowfall, and snow depth; however, about one half of the stations report precipitation only. Both the record length and period of record vary by station and cover intervals ranging from less than a year to more than 175 years. The system assigns a unique version number for each updated and fully reprocessed copy of the GHCN-Daily dataset, and each dataset version is then archived at NOAA/NCEI. GHCN-Daily and its processing system also serve as the official archive and processing system for U.S. Cooperative Observer data, which have been comprehensively, integrated into the dataset along with other U.S. daily data sources. Users of U.S. data are encouraged to see further notes on the Source Data section below regarding real-time versus time-delayed, archive quality updates. In general, real-time, replacement of update data streams are replaced by archive-ready data sources 45 to 60 days after the close of a data month. Major changes to the processing system as well as announcements of significant data additions to GHCN-Daily are provided via an RSS feed and in the GHCN-Daily status reports. Information on the dataset format, metadata, and definitions of the data quality, management, and source flags that accompany each datum is provided in the readme.txt file. NCEI has obtained GHCN-Daily source data via personal contacts with representatives from National Meteorological and Hydrological Centers (NMHCs) around the world, through official bi-lateral agreements, and from a number a data archives at NCEI. These sources fall into four broad categories: 1) the U.S. Collection; 2) the International Collection; 3) Government Exchange Data; and 4) the Global Summary of the Day. A brief synopsis of each of these categories follows. Note that the source for each datum is indicated by a source flag as described in the readme.txt file. The U.S. Collection contains daily data from a dozen separate datasets archived at NOAA NCEI. These archives provide some of the earliest observations available for the United States (from the U.S. Forts and Voluntary Observer Program covering much of the 19th century) to the latest measurements from state-of-the-art climate monitoring stations that make up the U.S. Climate Reference Network. GHCN-Daily thus contains the most complete collection of U.S. daily climate summaries available. Currently active U.S. stations in GHCN-Daily have updates both via real-time data feeds and via time-delay, archive-quality data feeds. U.S. data users formerly accustomed to receiving “final” archived data (e.g. for DSI-3200) should confirm that a real-time data source for a particular station/day has been replaced by an archive-quality data source. Real-time data sources include the High Plains Regional Climate Center data feed (source flag=”H”) and real-time ASOS summaries (source flag=”A”), which are subject to change upon receipt of archive-quality sources. Archive-ready data sources are normally available 45-60 days following the close of a data month and include DSI-3207 (WxCoder3 data; source flag=”7”). There is continual reprocessing of the GHCN-Daily and because receipt of changes/additions occurs even for archive-quality data sources, a data value and/or quality flag is subject to change even after all archive quality sources are integrated. However, changes to data values for U.S. data are rare 60 days after the close of a particular data month. 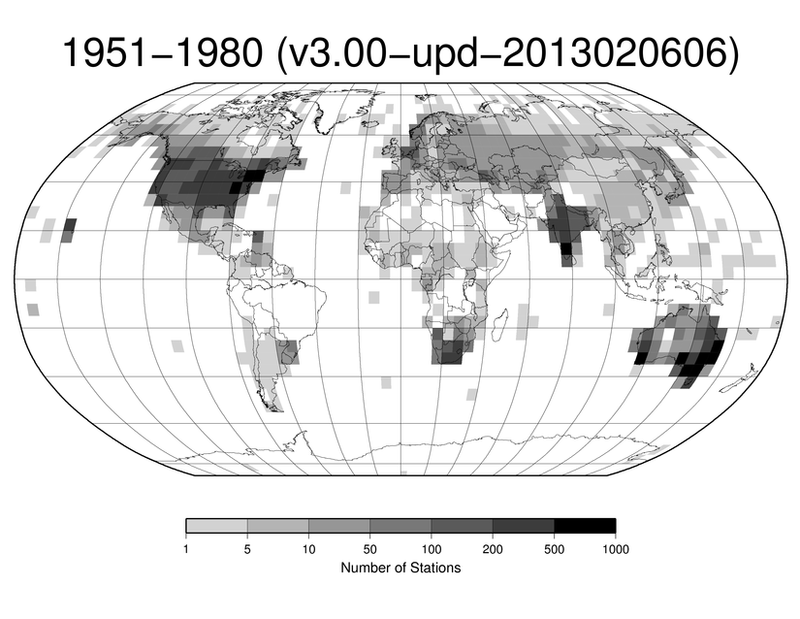 The International Collection contains historical records for approximately 20,000 locations outside the United States (from over 100 different countries) and largely reflects the data collection efforts that led to the release of Global Daily Climatology Network dataset (the predecessor to GHCN-Daily). Personal contacts in various countries generally contributed records for the International Collection. 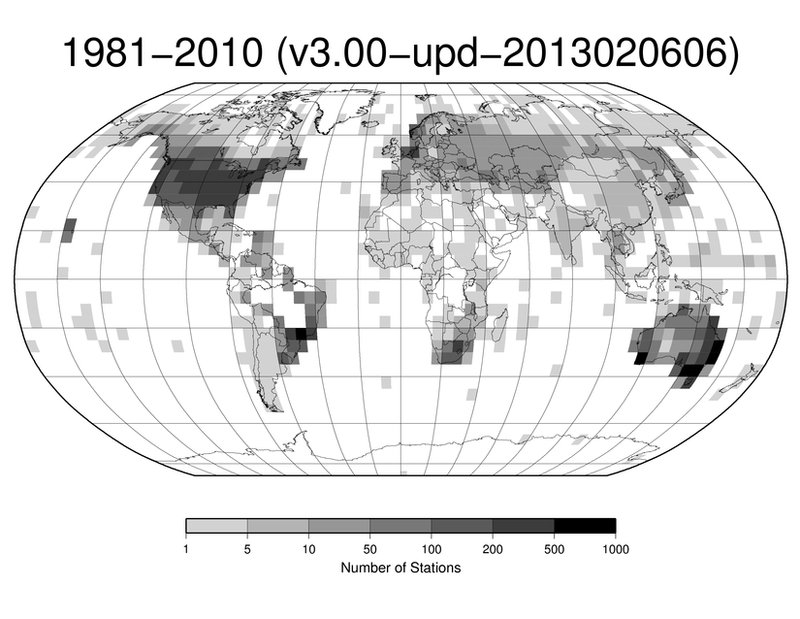 Contributions to the International Collection have resulted in particularly dense station networks with daily precipitation totals in Brazil, South Africa, and India, although the summaries from this collection are purely historical and are not updated on a regular basis. Precipitation records end generally in the late 1990s for Brazil and South Africa, and in 1970 for India. Government Exchange Data refers to data collected through official Global Climate Observing Systems (GCOS) or bilateral agreements. 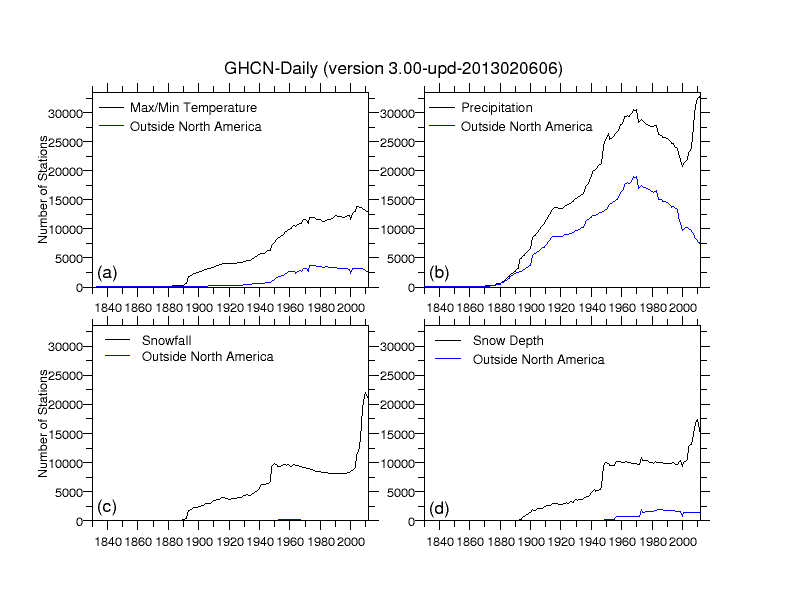 In the best case scenario, an NMHC may offer its complete digital, daily climate database for inclusion in GHCN-Daily, which is the case for Canada (with over 7500 station records provided) and Australia (with over 17,000 station records). In other cases, NMHC’s have provided daily data only for the GCOS Surface Network stations under their jurisdiction. Apart from Canada and Australia, systems regularly update Government Exchange Data for only a handful of stations, but new historical contributions are periodically added to this collection. The Global Summary of the Day contains 24-hour summaries encoded in the special “climatological code” group transmitted with SYNOP reports on the GTS. NCEI archives these reports in the Integrated Surface Dataset (ISD; DSI-3505) and the 24-hour summary period purportedly ends at midnight UTC (i.e., 2400 UTC). Daily maximum and minimum temperatures from this source are included in GHCN-Daily only when provided as a nominal 24-hour climatological summary as indicated in the SYNOP messages, whereas daily precipitation totals are also included when they must be summed from two 12-hour or four 6-hour sub-totals (as provided in standard SYNOP code groups). Identification of sub-daily summations is indicated by the associated “measurement” flag codes for each datum. In any case, daily summaries from the Global Summary of the Day may differ significantly from climate summaries with 24-hour periods ending at local midnight, particularly in the case of precipitation. Nevertheless, data from this GTS source are available for a number of locations that are not contained in any other data source available to NCEI, and they provide the only source of updates for many stations. There are approximately 20,000 updates with observations from within the last month within the total of more than 100,000 stations contained in GHCN-Daily. While many sites report only precipitation, daily maximum and minimum temperatures are also available from more than 25,000 sites, and many stations in North America also report snowfall and snow depth. Snow depth observations for stations outside of the United States originate from the synoptic reports in the Global Summary of the Day dataset. The interval covered by GHCN-Daily station records varies from less than one year to over 175 years, with the average record spanning four decades or more. Currently, the earliest observation in the dataset is a daily precipitation total recorded on January 1, 1832 at Parramatta, Australia (GHCN-Daily ID = ASN00066046; total = 0.0 mm). The earliest maximum and minimum temperature measurements are from January 2, 1833 at Uccle, Belgium (GHCN-Daily ID = BE000006447; maximum temperature = -1.4°C and minimum temperature = -4.8°C). 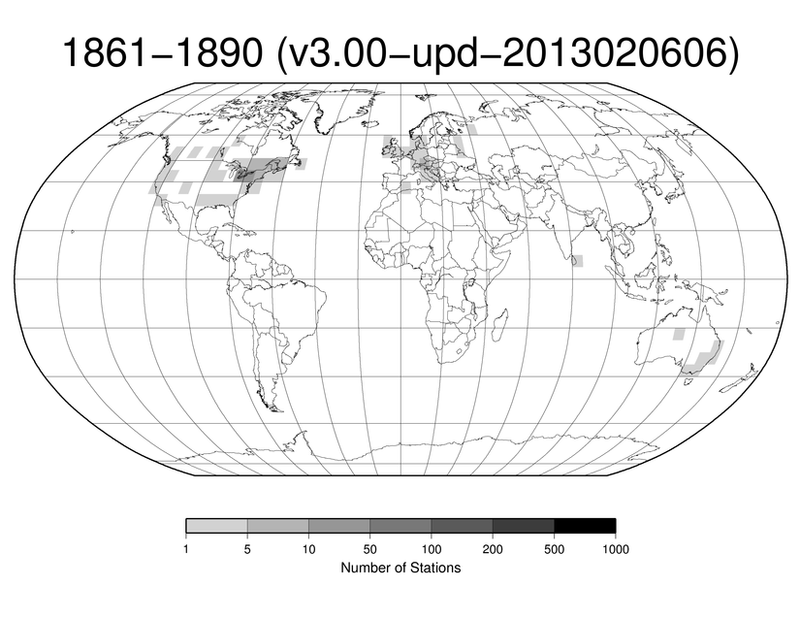 Uccle, a GCOS Surface Network station, is still active and provides the longest daily station record in the dataset. The Table contains maps indicating the density of stations that have at least 10 years of precipitation or temperature records during successive 30-year intervals starting in 1861. Like GHCN-Monthly, the concentration of stations with observations of temperature or precipitation in GHCN-Daily is denser over North America and Eurasia than over Africa, Antarctica, and South America. In the case of GHCN-Daily, however, the densest historical station networks come from the United States, Canada, and Australia--a reflection of the comprehensive contributions from these countries. Nevertheless, Brazil, India, and South Africa have also contributed records from very dense national precipitation networks. 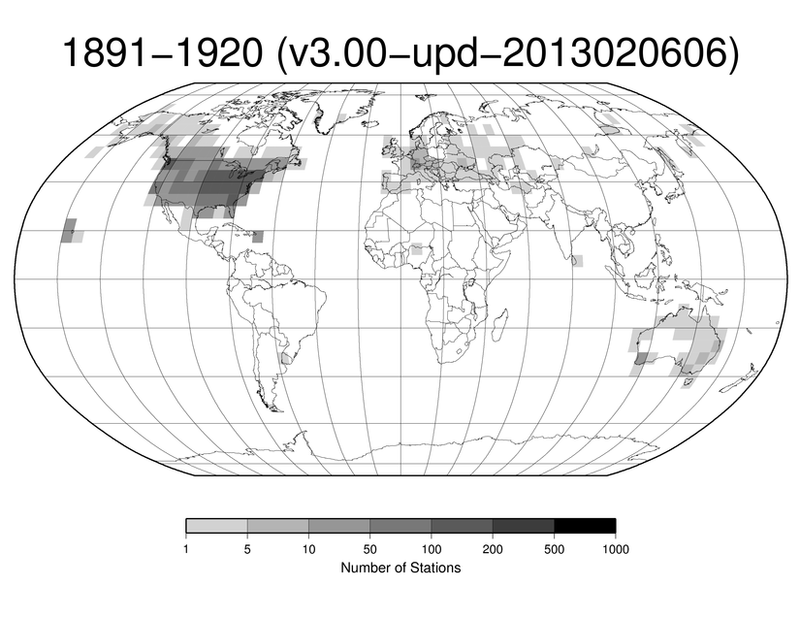 The temporal evolution of the station network is such that daily summaries are available from a relatively small number of stations before 1890 when the number of stations reporting maximum and minimum temperature (precipitation) is about 2.5% (8.9%) of the peak number. 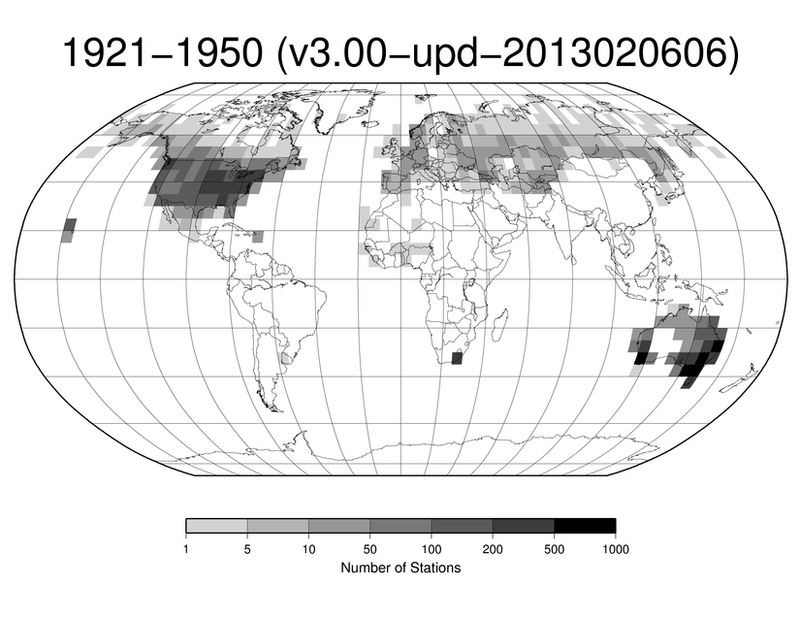 The total number, spatial distribution, and temporal completeness generally increase through time for all variables, although both the temperature and precipitation networks attain their maximum density in the 1960s. For the periods of record of individual stations and elements, see the GHCN-Daily inventory.